LEGO Star Wars Forum | From Bricks To Bothans • View topic - New box sizes? Noticed two different sized boxes for 8093 tonight, I had not noticed this before, this is old news or is TLG downsizing the boxes? It makes sense to me, lots of empty space in most boxes. Seemed like a waste of money for shipping and materials. I remember there were a few questions about box size in the Lego survey I took a few weeks/months ago. They were the same price on the shelf but had different barcodes and the new, smaller box would not scan at the price checker. I would be very happy with smaller box sizes. The current ones are just too big for what you get. I understand the reason for it from a marketing perspective but considering these toys are imports it is very wasteful. I'd even be willing to pay the extra penny. I like the smaller size, especially if it carries across all price points and not just the cheaper sets like this example. I equate the change to DVD vs. Blu-ray packaging: the original cases just seem so chunky now compared to the slimmer versions, and I personally don't perceive any change in "value" because of the decreased packaging size. Is LEGO really listening to their fans that have been taking their surveys? Smaller is better. Let's hope that there are changes in packaging size all across the board. This and a cardboard backing for set instructions/stickers will make me very happy. I like the huge boxes, it makes me feel like I'm getting the little prize out of a huge box of cereal that they forgot to fill with cereal. While it's obviously not even remotely pursuant to most people here, the smaller boxes will be a welcome relief to sellers on the secondary market (and consequently for the buyers) because of the rising costs of shipping with all the major carriers. So I guess a win for TLG's bottom line in shipping costs will translate to lower bottom line for resellers and buyers. that guy wrote: While it's obviously not even remotely pursuant to most people here, the smaller boxes will be a welcome relief to sellers on the secondary market (and consequently for the buyers) because of the rising costs of shipping with all the major carriers. So I guess a win for TLG's bottom line in shipping costs will translate to lower bottom line for resellers and buyers. That will be nice. I keep getting requests for quotes and then complaints on the cost of shipping from people overseas who want the sets in the boxes, especially the sets with the longer boxes. It's not my fault LEGO put a 2lb set in a 10lb box. I approve of smaller boxes. Less packaging, less waste, (although if I'm getting rid of a box, I'm recycling it). 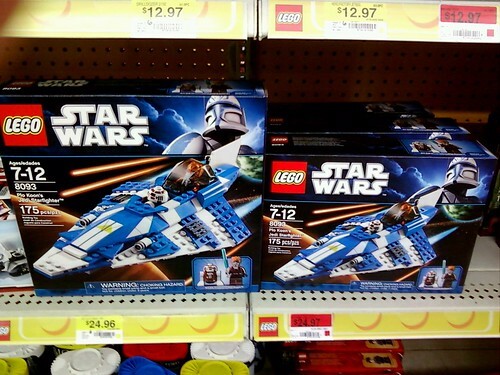 Anybody who has the box for the first Jedi Starfighter (7143) will see that it's nearly the same size as the smaller box in the above photo. Sure, it has 30-40 fewer pieces, but there's plenty of space in the smaller box for a few more plates. I also understand MisterFubar's concern about shipping quotes. I sold a MISB set recently and due to the size of the box, there was no way I could avoid the cursed "dimensional weight" surcharge at the post office. edited to make it readable, sorry folks, way too much going on today. Last edited by Mofo Jones on Mon Feb 28, 2011 11:19 am, edited 1 time in total. I applaud the new packaging. It's always seemed so phony to me, especially recently, that LEGO makes the boxes so much ridiculously larger than the sets. It's purely to make buyers think the set actually does take up the whole box. The TIE Defender is one of the worst examples of this (along with its price per part ratio). The box should realistically be no larger than the one for the 09' Vader's TIE, yet it's even larger than the T6 shuttle box. Sadly I don't think they'll ever reduce the size of the Defender box because then people really WILL realize that it's not even close to being worth $50. ItsTwentyBelow wrote: Sadly I don't think they'll ever reduce the size of the Defender box because then people really WILL realize that it's not even close to being worth $50. Not to point out the obvious but that's a null statement as the TIE Defender is no longer made. Point taken however and as I've stated above I love the decision as well as it will certainly make my life easier in the future. Fine with me, now I'll be able to store more sets in the same amount of cabinet space. Is re-sizing box dimensions in the middle of a production run a first for TLC? I don't recall this happening before. Good news either way. Anyone else notice the price stickers underneath? $24.96 for the big box version, $24.97 for the small one! It's a conspiracy! They want you to buy the big wasteful box! Lego hates trees! Solo wrote: Lego hates trees! "No, cut them all down! Hurry. Curse my metal body....."
As the Defender was a winter '10 set, and sets have a production run of roughly 2 years, I'm sure it will still be in production until around November or so. But they won't change the box at this point anyway so it doesn't matter! I like the idea of smaller boxes and I hope it spreads throughout the lines. I tend to buy sets in bulk (usually during sales) so it will be easier to move them around. If the sets are for parts/figures, I usually open several of them at once and this will seriously cut down on the amount of trash it produces. Lastly, as one of those folks who does do some reselling, it will cut down on storage space and make it so I don't have to use huge boxes for shipping like I do now (which means I don't have to charge as much for shipping). I think this is a great idea and I hope it is further evidence that they are listening to the results of the surveys. Edit to add: As far as the price stickers, I've seen some crazy things with Wal Mart's red tags. The one nearest me has a few things in the clearance department that have price tags for a higher price than when they were on the regular shelves. And there are a few items that have been in there since XMas '09 that are still at the same (higher) price. Last edited by Tyrant on Mon Feb 28, 2011 12:04 pm, edited 1 time in total. I for one welcome these smaller boxes. ItsTwentyBelow wrote: As the Defender was a winter '10 set, and sets have a production run of roughly 2 years, I'm sure it will still be in production until around November or so. But they won't change the box at this point anyway so it doesn't matter! No, seriously, it's gone. Look on Lego's website. No longer listed. They blew them out during the holiday massacre and every retailer who has them is dumping their final stock as well. Lego is no longer on a 2 year run model and I've heard from at least one Lego rep that they are consciously moving through sets faster to keep sales up. Yes there will always be sets that hit the 18-24 months life like always but more and more they will be shortening life cycles. They have made radical changes to it's product cycles and there were a number of sets that had a 6 month run last year for example the City House, TIE Defender, Helicpoter/Limo, etc. Anyway, TRU is doing $35 right now and Walmart no longer has them listed. Either way, it was a great set for the $25-$35 price point and is a good build despite the atrociously sized box. ItsTwentyBelow is right when saying LEGO will never reduce the size of the TIE Defender box. that guy is right for the reason that LEGO will never reduce the size of the TIE Defender box. Solo wrote: Anyone else notice the price stickers underneath? $24.96 for the big box version, $24.97 for the small one! It's a conspiracy! They want you to buy the big wasteful box! Lego hates trees! The $24.96 is for the Battle of Naboo, I moved the bigger box next to the smaller box for the photo, strangely, the two were not next to each other, they each had their own spot on different parts of the aisle. What I thought was strange is that they used the red clearance tag, that is what initially grabbed my attention. I personally enjoy the old large boxes, They just look so much nicer.